In Raphael’s painting various luminaries stand or sit in poses on the steps, but look to the left of Plato and Aristotle and you’ll see a poor looking figure in a green robe talking to people – that’s Socrates. Most technology in teaching has run against the Socratic grain, such as the blackboard, turning teachers into preachers and lecturers. With chatbots we may be seeing the return of the Socratic method. This return is being enabled by AI, in particular Natural Language Processing but also through other AI techniques such as adaptive learning, machine learning, reinforcement learning. AI is largely invisible, but it doe have to reveal itself through its user interface. AI is the new UI but because the AI is doing a lot of the smart, behind the scenes work, it is best fronted by a simple interface, the simpler the better. The messenger interface seems to have won the interface wars, transcending menus and even social media. Simple Socratic dialogue seems to have risen, through the process of natural selection as THE interface of choice, especially on mobile. So can this combination of AI and Socratic UI have an application in learning? There are several reasons for being positive about this type of interface in learning. 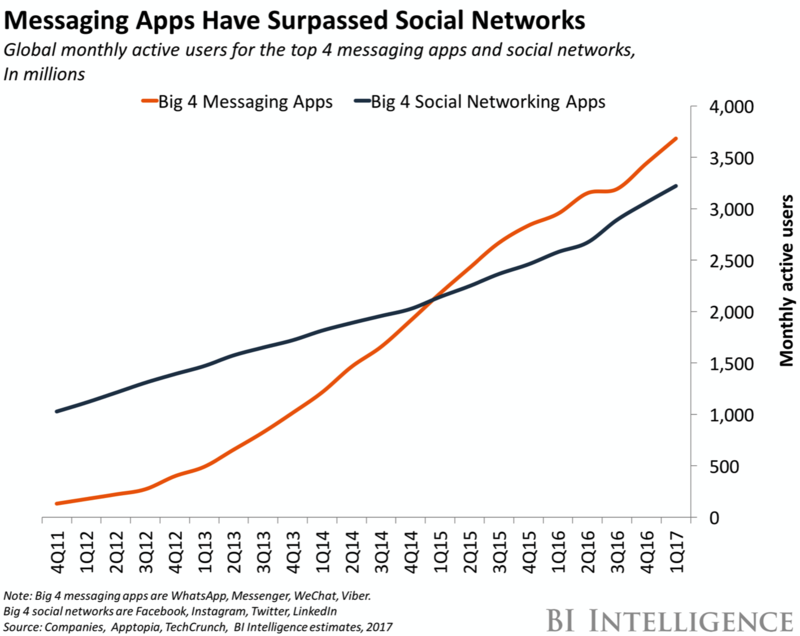 We know that messaging, the interface used by chatbots, has overtaken that of social media over the last few years, especially among the young. Look at the mobile home screen of any young person and you’ll see the dominance of chat apps. The Darwinian world of the internet is the perfect testing ground for user interfaces and messaging is what you are most likely to see when looking over the shoulder of a young person. So one could argue that for younger audiences, chatbots are particularly appropriate, as they already use this as their main form of communication. They have certainly led the way in its use but one could also argue that there are plenty of reasons to suppose that most other people like this form of interface. Easy to use, it allows you to focus on the message not the medium. The world has drifted towards messaging for the simple reason that it is simple. By reducing the interface to its bare essentials, the learner can focus on the more important task of communications and learning. All interfaces aim to be as frictionless as possible and apart from speculative mind reading from the likes of Elon Musk with Neuralink, this is as bare bones as one can get. 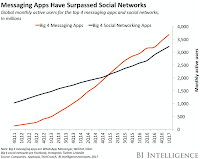 Messaging is simple, a radically, stripped down interface that anyone can use. It requires almost no learning and mimics what we all do in real life – simply dialogue. Compared to any other interface it is low on cognitive load. There is little other than a single field into which you type, it therefore goes goes at your pace. What also matters is the degree to which it makes use of NLP (Natural Language Processing) to really understand what you type (or say). One of the joys of messaging, and one of the reasons for its success, it that it is succinct. It is by its very nature chunked. If it were not, it wouldn’t work. Imagine being on a flight with someone, you ask them a question and get a1 hour lecture in return or imagine. Chatbots chat, they don’t talk at you. In a most likely apocryphal story, where Steve Jobs presented the Apple Mac screen to Steve Wosniak, Jobs had programmed it so say ’Hello…”. Wosniak though it uncessary – but who was right? We want our technology to be friendly, easy to use, almost our companion. This is as true on learning as it is in any other area of human endeavour. Nass & Reeves, in The Media Equation, did 35 studies to show that we attribute agency to technology, especially computers. We anthropomorphise technology in such a way that we think the bot is human or at least exhibits human attributes. Our faculty of imagination finds this easy, as witnessed by our ready ability to suspend belief in the movies or when watching TV. It takes seconds and works in our favour with chatbots, as dialogue is a natural form of human behaviour and communication. If you have qualms about chat replacing human activity, remember also, that many learners are reluctant to ask their tutor, lecturer, manager or boss questions, for fear of embarrassment, as it may reveal their lack of knowledge. Others are simply quiet, even introverts. Anonymous learning, through a chatbot, then becomes a virtue not a vice. Wellbeing bots may also want to preserve anonymity. In this sense, chatbots may be superior to live, human teachers and bosses. Time and time again we see how technology is preferred to human contact – ATMs, online retail and so on, in learning, in some circumstances we also witness this phenomenon. The brain is a social organ, likes to receive stuff in chunks and interact when learning. We are social apes, grammatical geniuses at age 3 and learn to listen and speak long before we learn to read and write (which take years). Chatbots, such as Siri and Alexa already exist and, with the addition of text to speech and speech to text, turn chat into the exchange of speech. Reading and writing are replaced by listening and speaking. Of course, one must be careful here, as chatbots have real limitations. They work best in narrow domains, with a clear purpose. Their ability to deliver full-milk, sustained dialogue is limited. Nevertheless, they can deliver learning functions aright across the learning journey from on-boarding, learner engagement, learner support, mentoring, teaching, assessment, practice and well being. Chatbot interfaces can be fully scripted using no natural language processing at all or they can use varying levels of NLP to allow for variations on input. At the simplest level it can cope with synonyms and different word order. Large services by the big players, such as IBM and Microsoft offer much more naturalistic interfaces. Whatever your choice, regard the dialogue interface as something separate.